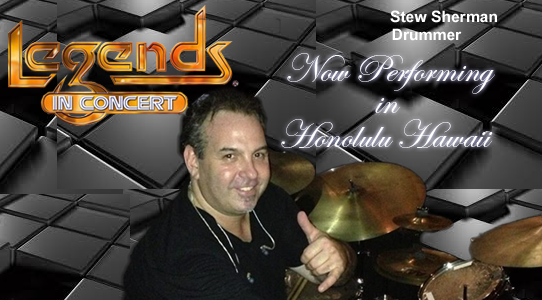 Stew Sherman has been performing as a professional Drummer since the age of thirteen. Starting out in Junior High and High School band, Stew quickly moved on to the local club scene, and venues throughout New York City. At the age of twenty-one, Stew relocated to Los Angeles California where he began to play with some of the top musicians and artists in the industry. “The Temptations”, “Puff Daddy”(MTV Video), Atlantic recording artist “Rome”, “Michael McDonald”, “Ray Parker JR.”, “Denise Williams”, “Henry Kapono”, “Cecelio and Kapono”, “Ricky Peterson”. Now residing in Honolulu, Hawaii, Stew continues to tour, record and perform with various artists and musical situations, and covers all styles of music.